Madonna recently gave the world a sneak peak of what keeps her face looking so young and refreshed by showing everyone her secret "fork facial." However, representatives from NeurotriS revealed that the "fork facial" is actually one of its microcurrent devices, with details discussed here. According to Tony Picciano, CEO of NeurotriS, the "fork facial" is actually NeurotriS' Dynamic Intelligent Electrotherapeutics machinery. Here, he discusses the technology behind electrotherapeutics and microcurrent, and how estheticians and spa owners can start implementing this "fork facial" treatment into their spas. Picciano perfers the term electrotherapeutics over microcurrent, and he believes there is a lack of understanding on the science behind the technology. He noted that every client's skin is different. Therefore, he believes microcurrent or electrotherapeutic technology should be tailored to each client, perhaps what has made his device successful and appealing to celebrity clientele. His electrotherapeutic machine can put out different "signals," frequencies that are combined into a preset program, for different clients based on formulas that will monitor the skin impedance, type of waveform, voltage and surface of the output accessory. Thus, values for signals may change for the same client on a day-by-day basis depending on the hydration of the skin, mineral levels and other factors. The machines use systems that automatically calculate proper signal values at the time of the treatment. "Every signal travels through the skin differently, so they need to be treated accordingly. [Our machines] measure your skin and tissue density to output the perfect levels of microcurrent based on your skin type at the time of the treatment." Picciano explained. NeurotriS has an FDA submission for approval on its machines because it follows the same formula to adhere to the concept that the electrotherapeutic signals will travel through the skin differently. The current believed "true microcurrent" voltage is 400 micro amps, μA, which most likely will not be suitable for all skin types. In addition to customized signals for the individual, the device also offers face and body sculptors in its different types of machinery. "There are different signals for the face and there are different signals for the body. Every signal reacts differently through the skin, so if we're going to do a body sculpting we want to do muscle building and inch loss. That requires a different type of signal than what we give to the face," Picciano discussed. The body scuptors have up to 18 independent isolated multi-signal microcurrent channels with 22 optional outputs. The facial toners have up to four independent isolated multi-signal microcurrent channels with six optional outputs. The multi-signal microcurrent features in the machines allow for a more efficient treatment of the skin compared to a single channel system. 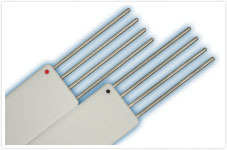 The "forks" featured in Madonna's social media post are the company's Pico Probes.The four different prongs on each probe outputs an independent signal that is not associated to the others for more volume during the treatment. The electrotherapeutic facial or body treatment has a vast variety of benefits for your clients, as outlined below. Since this procedure is non-invasive, esthetician and spa owner could add this machine to their menu once they have been properly trained as long as it is in their state's scope of practice.